There are a total of three states that have passed online poker regulations. Those states are Delaware, Nevada and New Jersey. There are several other states that have considered online gambling legislation. Some have gotten closer to regulating online poker than others. At this point, Pennsylvania is the favorite to become the next state with regulated online poker. Other possibilities include California, Michigan, New York and Massachusetts. Online poker is only legal and regulated in Delaware, Nevada and New Jersey. Delaware and New Jersey also spread legal online casino games. Nevada offers mobile sports betting in addition to online poker. All three states launched online poker in 2013. No states have managed to get an online poker bill through its legislature since. This is often due to a disagreement among stakeholders. In California, many tribes want to exclude PokerStars from the industry. This is due to PokerStars being perceived as a “bad actor” because it accepted American poker players until Black Friday, which was April 15, 2011. Pennsylvania appears to have opposition from a small number of the state’s casinos. Sands is among that group. That is because Sands’ CEO is Sheldon Adelson, a vocal opponent of online gambling, bankrolls anti-online gambling lobbying efforts. Michigan already has some forms of legal online gambling. This includes online slots, keno games and lottery sales. Georgia has a similar setup through its state lottery. Some 15 years after the first hands were dealt at Planet Poker, a state finally voted to regulate online poker. Three different states went live in 2013 with Nevada becoming the first on April 30th followed by New Jersey later in the year. Delaware merged player pools with Nevada two years later. To date, these three states are the only ones to regulate and deal real money online poker games. Delaware has legalized online poker, casino games and lottery ticket sales. The state received bids from 14 companies to help launch online gambling. 888 won the contract. Online poker and casino games launched on November 8, 2013. Delaware combined its player pool with WSOP.com in Nevada in March 2015. Nevada became the first state to legalize online poker in December 2011. The state already allows online and mobile sports betting, but has not legalized online casino games. Nevada has given its governor the right to enter into interstate compacts, though none have been created at this time. Ultimate Poker launched on April 30, 2013 to become the first regulated online poker site in the U.S., but eventually failed. WSOP went live on September 17, 2013. Real Gaming became the third Nevada site in February 2014. That site does not spread any games and is considered to be dormant. New Jersey legalized online poker and casino games in February 2013. Governor Christie signed the bill into law after a conditional veto that ordered the state legislature to change the tax rate and increase funding for problem gambling. Governor Christie had previously vetoed a similar bill in full in 2011. New Jersey real money internet games went live on November 26, 2013. There were five poker networks at launch; Party Poker/Borgata, WSOP, 888, Ultimate Poker and Betfair. Only Party/Borgata and WSOP/888 still operate out of that group. PokerStars entered the New Jersey industry in 2016. Bills have come before nearly a dozen state legislatures. Some died without ever having a committee hearing. Some made it all the way to the governor’s desk. There are several examples of ones that made it somewhere in between. California is the largest state in terms of population. It is the only state that has considered online poker where the population could sustain a healthy online poker environment. California joining the US online poker pool is key in terms of liquidity when online poker eventually launches. Unfortunately, there are too many disagreements between commercial card clubs and tribes about who should be allowed to offer online poker and how taxes would be paid. Until all of the state’s gaming interests can agree there will be no online poker in California. There were two bills under consideration during the 2016 California Legislature. Both died before making its way to the state senate. While players are not affected, Illinois criminal code makes it explicitly illegal to operate an internet site that accepts any bet. This includes poker, casino games and sports betting. Despite this, there were several attempts in 2013 to add online gambling to a bill that would have expanded brick and mortar gambling in the state. The bill ultimately failed because Illinois Governor Pat Quinn did not support such a broad measure. Discussions are still being held on the subject, but no bill has surfaced since. The state’s pension system is in dire need of funding and many politicians in Illinois expect gambling to be one of the few ways to accomplish it. Iowa managed to pass online poker regulations in their senate in 2012, but it failed to receive a vote on the house floor. The bill did not go to a vote in either chamber in 2013 or any year after. The proposals would allow existing casinos to offer online poker to Iowa residents. Iowa has a history of being progressive when it comes to gaming. It was the first state to legalize riverboat casinos in 1991. It is now home to a thriving casino industry that is still waiting for its opportunity to join the online gambling industry. Mississippi Representative Bobby Moak has tried to legalize online gambling to state residents by introducing the Mississippi Lawful Internet Gaming Act year after year. The bill would legalize online poker and casino games, but has been met by resistance among state conservatives. It has failed every year since 2012. Five Pennsylvania online poker and casino bills materialized in 2015. Versions of those bills returned in 2016. Pennsylvania is currently the favorite to be the next state to regulated online poker. Only Pennsylvania residents 21 years of age or older would be allowed to play. Washington DC legalized online poker before any state did. This was in 2011. Unfortunately for residents and visitors to the nation’s capital, the law giving these rights to the lottery was eventually repealed. There have been no discussions to reinstate it. While Delaware, Nevada and New Jersey were busy legalizing online gambling, a few states decided to take a different route. 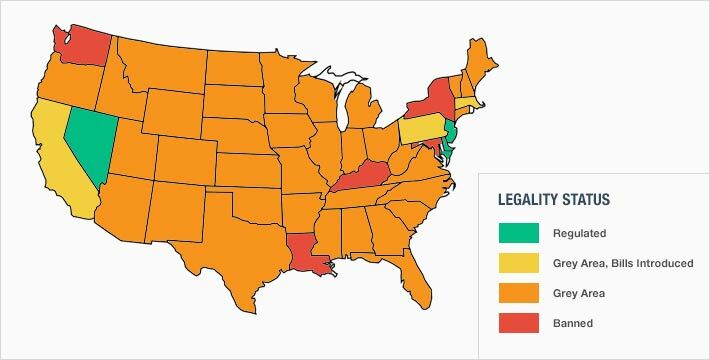 Four states specifically outlaw online gambling. Two of these states only target operators. The other two also make it illegal for players to give action to online poker and casino sites. No player has ever been charged with a crime in these states. Hawaii does not have any brick and mortar gambling. The state does not even have a state lottery. That is because the state’s massive tourism industry is opposed to the competition for tourist dollars. The proposed online gambling regulations would include poker and casino games, which would be aimed at residents. The regulations would create an online lottery commission. The bill was proposed five times in the late 2000’s and early 2010’s. It never received a vote in either of the state’s chamber of government. The bill finally stopped being introduced. Louisiana is another state where players are targeted. State residents that play at an online poker or casino site can be charged with a misdemeanor. The fine may be up to $500. Like Washington, no player has ever been charged with violating this statute. Utah is one of just two states where there are no forms of legalized gambling. This includes lotteries and bingo. The Utah Legislature passed a law that forbids the operation of online poker and casino sites in 2012. The law went a step further. It opts the state out of any federal law that might regulate online gambling if that ever occurs. Washington state is the only state where simply playing online poker is a felony. The state passed this law in 2006 to protect its card clubs and tribal casinos. The Poker Players Alliance filed suit to challenge the law. The Washington Supreme Court ruled the law valid in 2010. No players have ever been charged with playing at online poker or casino sites. There is little action at the state level in terms of online gambling. The three states that have already legalized it are described as “low hanging fruit” in terms of passing online gambling into law. There are too many factors in play in other states. Five years after Black Friday, unregulated online poker is still the only option for players in 47 states. Some unregulated sites are thriving. The biggest problem is that those that would like to legalize online gambling cannot decide on how to do it. This includes taxes, types of games and the companies that would be permitted to spread it. Part of this is due to PokerStars, a company that settled charges that it offered illegal gambling to U.S. players until it was indicted in April 2011. The settlement did not force PokerStars to admit guilt. It permits PokerStars to enter regulated markets in the United States. This is not good enough for some lawmakers and gaming operators. For example, Nevada forbids PokerStars from operating in the state. Similar bills have been submitted in California. New Jersey licensed PokerStars to operate online poker and casino games. Who is Offering Online Poker to United States Players?